Programming Board (PB) wants to be as transparent as possible in addressing decisions surrounding FallFest and concerns for SpringFest. These community qualms include confusion about the budget, questions around the SpringFest artist and student expectations about PB’s role. There are things to clear up. At last year’s SpringFest, Goldlink canceled unexpectedly. The money for Goldlink did not roll over into this year’s budget. The PB budget resets every year, and any extra money is directly absorbed into the budget for Associated Students of Occidental College (ASOC). This year, we received less money than last year from the Dean of Students and approximately the same funding from ASOC. PB is not the only organization with less funding this year — there are campus-wide budget cuts to reallocate funding to other needs at Oxy. In addition, minimum wage and inflation have increased. While we recognize the importance of FallFest and SpringFest to the Oxy community and Oxy tradition, there are needs on campus involving students’ equitable access to wellness and education. Despite our decreased budget, PB wants to host an incredible SpringFest with help from the student body. PB’s annual budget dictates costs for FallFest, SpringFest and other smaller events PB hosts throughout the year. PB’s 2018–2019 budget is approximately $113,000, allocated between ASOC and the dean of students. We understand this is an enormous budget, but consider the investment of producing concerts. In most cases, the more expensive the artist, the more expensive the production. When choosing an artist for either concert, PB must consider more than just the artist fees — there are also costs for the stage, sound, lights and safety. This year’s FallFest had multiple artists, and KOXY provided equipment and sound as an opportunity to collaborate and save money for a larger SpringFest. This gives PB the same budget for SpringFest as last year, totalling around $90,000. Our budget for the SpringFest artist ranges between $45,000 and $60,000. PB makes decisions regarding FallFest, SpringFest and other events among its staff of students. Additional concerns over the location of SpringFest (the Greek Bowl or Rush Gym) are debated within student, staff and alumni groups at Oxy. Although PB is pushing for SpringFest in the Greek Bowl, the timing of SpringFest may be too close to commencement and could interfere with maintenance preparation. PB considers various factors when picking artists, including reflecting the values of our institution. When choosing an artist that considers Oxy’s values, PB heeds accusations or convictions of sexual misconduct and assault (for example, PB considered Playboi Carti for a previous SpringFest but did not discuss further due to charges of domestic violence). PB also tries to book more local artists and student DJs. Additionally, there is potential for price range fluctuation dependent on an artist’s release of new music or a change in popularity. Opportunities to book artists such as T-Pain, Kehlani or Dom Kennedy and Marc E. Bassy are due to their affordability at the time. The artist must be able to be in Los Angeles and uncommitted to other events that may require a contract prohibiting them from performing elsewhere. For example, the radius clause for Coachella Valley Music and Arts Festival can make it difficult for artists who perform at Coachella to commit to other concerts. In an attempt to limit overlap and limitations because of Coachella weekends, SpringFest will be April 6, 2019. Moving forward, PB wants more student input. In previous years, PB has done research and discussed the SpringFest artist among its student staff before sending the contract to PB’s agent for negotiation with the artist. Traditionally, PB has kept the artist a secret, building hype around the annual concert. 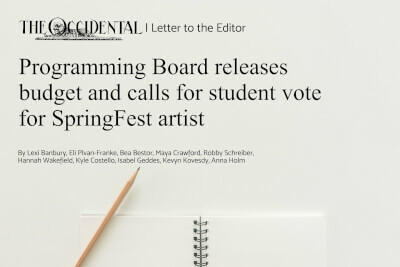 However, due to concerns from the student body, shifts in the budget and a desire to provide Oxy students with an exciting artist, PB wants to include the student community in choosing the 2019 SpringFest artist. PB is currently narrowing down the artist search to between five and seven feasible artists. From there, we will ask Oxy students to vote. Following this letter, PB will send an email to all Oxy students, allowing everyone the opportunity to vote on potential SpringFest artists. There are no guarantees we will be able to secure a contract with the most popular artist based on voting. We will do our best to negotiate and choose an artist that best reflects the desires of the student body. In the meantime, feel free to leave us comments, suggestions or questions through the PB Google Form or our email, pb@oxy.edu.